This villa is definitely striking! Two steel wings cap the roof, and the pool flows over the top deck to form a fountain on the lower level. The kitchen is cool too because the bar juts out through the window to form the outdoor dining table. Villa Wings has a view over the clear blue waters of St. Jean Bay and Pelican Beach. An abundance of wall-to-wall windows throughout the villa maximizes the breathtaking view. The infinity pool borders a hardwood deck, and becomes a fountain wall on the lower level. The terrace is multi-level, with ample seating throughout in the shade and in the sun. The main living area sits in an open and airy space that beckons guests to the view. This area flows directly into the terrace. The second living room also serves as a home cinema, and can be closed and air conditioned or opened to the view. The kitchen is conveniently close to the terrace and living areas, and the indoor dining room provides a view and seating for 8. The center island of the kitchen stretches outside to become a shaded outdoor dining area 8. This level also has a fully equipped fitness room with a wide-open view. The master bedroom is on the third level, with a queen bed, HDTV, ensuite bath, and wall-to-wall windows. The second and third bedrooms are also on the third level, one with a sea view and the other with a garden view, each with an ensuite bath. The fourth bedroom is below the living area, with twin beds that can be converted to a queen, ensuite bath, a view of the Atlantic, and semi-private deck area. 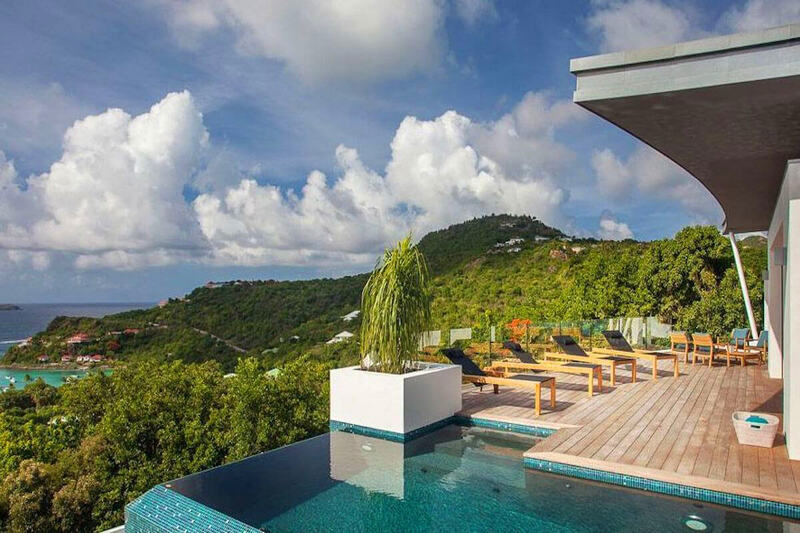 This villa is near St. Jean’s shopping, restaurants and beaches, and just a quick drive from Saline Beach and Gustavia. Guests will be met at the airport/car rental area and led to the villa by a local representative from the villa management company.